Previous year Solved Question Paper of Automobile Technology (404) NSQF Theory Class X CBSE Board Question Paper of Vocational IT 404 Code. Home » Vocational » Automobile Technology » Previous year Solved Question Paper of Automobile Technology (404) NSQF Theory Class X CBSE Board Question Paper of Vocational IT 404 Code. i. Question paper is divided into four sections. iv. The maximum time allowed is 3 hour. _________________ the axis of the crown wheel. 3. In a fully charged lead-acid battery the active materials for positive and negative plates are respectively ________________ and _____________________. 5. While washing a car clean the tyre sidewalls with a _____________________. 6. During servicing of a car, which has covered 15,000 Kms. in nine months of its running on the road, technician „A‟ was about to change the air filter but technician „B‟ stopped him and said the air filter has not completed its life so need not to be changed the filter. Who is correct? c. Attends product and sales training courses. 9. As per service manual, it is mandatory to check, the level of gear box oil and differential oil. a) List the name of different hand tools (general purpose tools) and write their uses. b) Explain the procedure of changing oil and oil filter in a car. c) Explain the procedure of changing coolant of a car. 1. Instruction for drawing up the MS should be followed carefully. 2. If general instructions have to be given, Do so, at the beginning of the page itself. 3. Some Subject will require specific directions for particular type N.B. : of questions. Give these at the beginning of the concern question. Do not omit indication of value points, times required for any of the questions, even though it may seem obvious. 11. Sprung Weight: The weight of the vehicle frame, body, engine, transmission and any other load on these components are supported over the suspension system, therefore, such weights are called as sprung weight. Un-sprung Weight: some parts of an auto-vehicle, which are fitted between suspension system and the road surface, are not supported by the suspension system. Weights of these parts are known as un-sprung weight. Examples of such weights are the rear axle assembly, wheels, tyres, brakes and the steering knuckle etc. 13. The customer service is a series of activities designed to enhance 2 the level of customer satisfaction that is, the feeling that a product or service has met the customer expectation before, during and after a purchase. 14. Customer support is a range of services provided to assist the 2 customers in purchase or maintenance of their vehicles. It includes assistance in planning, installation, training, trouble shooting, maintenance, upgrading, and disposal of a vehicle. 15. Blind-spot detection: This technology responds as soon as the driver puts on the turn signal, thereby preventing a collision caused by the driver‟s blind spot. If the driver making a turn too fast and the car senses a potential rollover, the rollover prevention system will apply the brakes and modulate the throttle as needed to help the driver maintain control of the vehicle. 16. Following are the advantages of using service manual. • It helps to know about the details of the vehicle. • It informs the vehicle owner regarding the maintenance schedule of different system of the vehicle. • It provides details about the servicing procedure of all the system, inspection and other related details. • It also provides information regarding various defects, their symptoms and rectifications. • It also converts the alternating current into direct current with the help of rectifier fitted along with it. • It is the source of electricity in automobile when the engine is running. • When the engine is running the alternator charges the battery by supplying the current to the battery through the charging circuit. 19. Micrometer (screw gauge): Screw gauge is a device incorporating a calibrated screw used widely for precise measurement of small internal and external distances with high accuracy. Multi-meter: A multi meter or a multi tester, also known as a VOM (Volt-Ohm meter), is an electronic measuring instrument that combines several measurement functions in one unit. A typical multi-meter may include features such as the ability to measure voltage, current and resistance. Hydro-meter: A hydro-meter is an instrument used to measure the specific gravity (or relative density) of liquids. In automobile it is used to check the specific gravity of electrolyte of battery. 1. Locate the old fuel filter, it may be in the engine compartment or under the car near the fuel tank. 2. If recommended by manufacturer, follow procedure to remove fuel pressure. 3. Unscrew each hose clamp bolt until it nearly comes apart from the nut. 4. Push the clamp up the hose. 5. Remove the old filter and replace with new filter. 6. Run the engine and check for any leakage of fuel. 22. Rollover Prevention: Most of the newer SUVs are equipped with electronic stability control systems, but rollover prevention systems take the concept one step further. If you are making a turn too fast and the car senses a potential rollover, the rollover prevention system will apply the brakes and modulate the throttle as needed to help you maintain control of the vehicle. 23. a) Different Hand Tools Files: The files are hand tools used to perform wide variety of metal removal tasks, like removing of sharp edges, smoothening of surfaces, shaping of jobs, finishing, producing intricate shapes etc. Pliers: Pliers us used to hold small objects and either tighten or loosen parts into place, cutting of wires and small objects etc. Chisel: The chisels are hand tools for cutting, shearing and chipping of metals. Screw Drivers: Screw drivers are tools often used by automobile mechanics to fit into screws and either tighten or loosen them into place. Wrenches: The wrenches are hand tools for tightening and loosening of nuts and bolts. 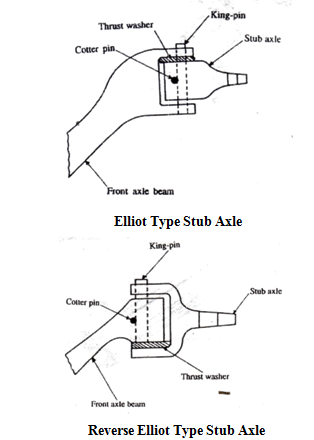 Wheel wrenches are used for opening of wheel nuts. Hammers: The hammers are used for straightening of sections, riveting, striking of nails, inserting the components by striking. Snips: Used to cut sheet metals to the required shapes. Punch: Used to drive objects, such as nails or to form an impression of the tip on a work piece. • Park the vehicle on a hard level ground and apply the hand brake. • Start the engine and run it for some time to worm-up the engine oil and switch off. • If you need space under the car jack it up and use jack stands to support it. • Get underneath the car and locate the oil drain plug and remove it with the help of wrench. • The old oil should be drained in a container. • Locate the oil filter and remove it with the help of wrench by rotating anti-clock wise. • Prepare the new filter – clean up the filter seat on the engine and place a light coating of oil on the gasket of the new filter. • Install the new filter by carefully screwing the filter into place by hand. • When the engine oil is completely drained fit back the oil drain plug and tighten with wrench. • Fill-up the new oil with the help of funnel and check the level of the engine oil with the help of dipstick. • Replace the oil cap. • Clean up all oil spillages on the engine and check for any leaks from the drain plug. • Properly dispose off the old oil and filter. • Prepare the vehicle: keep your car in plain space and keep engine off for few hour so that engine is cool. • Keep a pan below radiator. • Open the drain plug nut below radiator chamber by using wrench or by hand if possible. • Coolant will start coming out and all coolant will beemptied. • Fill the radiator to the top with the coolant. • Turn the engine on. Let if run for several minutes to get any air out of the system. Watch the temperature gauge to make sure the car does not overheat. After the radiator has burped up air bubbles, turn the car off and carefully fill the radiator to the top with coolant. Close the radiator cap tightly. Watch the temperature gauge carefully for the next few days. «Hindi Letter “ Ghumne jene ke liye Principal ko Prarthna Patra ”, “ पर्यटन पर जाने की अनुमति हेत अपने प्राचार्य को एक आवेदन पत्र “ Hindi Letter for Class 10, Class 12 and Graduate Classes.